Get ready for a buzz-filled April. A destination diner serving Polynesian cuisine and a secret society-themed Chinese restaurant are just two of many new openings that are spicing up Singapore’s diverse dining scene. Add to that a slew of F&B options at the new JEWEL Changi Airport and you will be busy making restaurant reservations throughout the month. Fancy an exotic island hopping adventure without leaving Singapore? 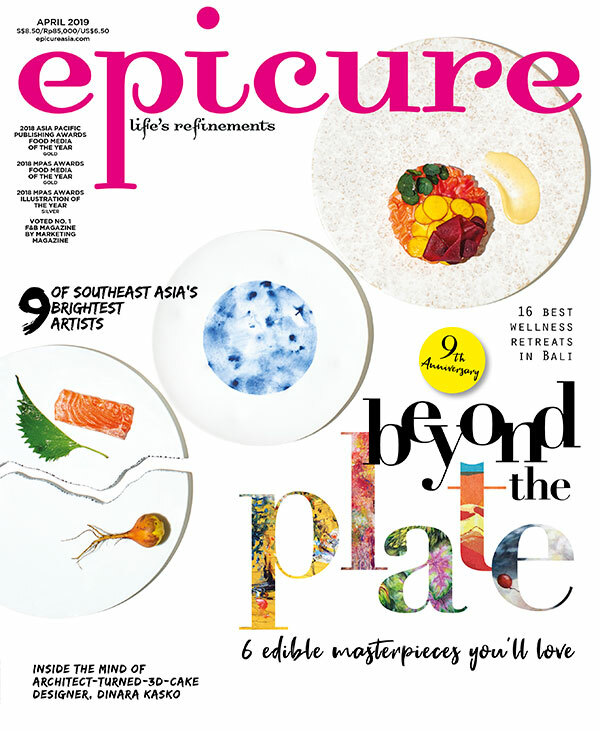 We are talking about a trip to Native Kitchen, Refinery Concepts latest F&B concept in Sentosa. Housed in The Village at Sentosa, the restaurant introduces dishes that are inspired by the West Indies, Carribean, Polynesia and Bali. Peppered with plants, the sprawling space provides a temporary mid-day escape. The Island Ceviche, raw barramundi cubes with lime, coconut milk and ginger dressing, offers a tangy and refreshing mouthfeel, while the Balinese style Bebek Goreng features fried duck leg with rice and piquant sambal. A new partnership between Ebb and Flow (the F&B group behind Restaurant Vianney Massot) and TungLok Group, The Dragon Chamber is a speakeasy restaurant along Circular Road. Guests arrive at an nondescript kopitiam with a few long tables and a fridge. Don’t be fooled though; open the fridge door which will lead you into a 45-seater restaurant that reminds you of the gambling dens and secret society hangouts of yore. Ancient Chinese-inspired artworks by Mister Tucks and Riandy Karuniawan deck the walls. The food is anything but as chef Wong Meng Ooi loves to push the envelope on Chinese cuisine. Expect mod dishes like Wagyu Truffle Beef Hor Fun ($68) and Firecracker Chicken and Maple Fritters ($16/28). The adventurous ones can order The Dragon’s Claw ($45), an entire braised crocodile foot served over a bed of kale. You know L’Entrecôte as the place for steak frites (cue bottomless fries) with outlets in Duxton Hill and The Heeren. Their latest opening at Customs House continues to offer what that and a little more. To cater to the drinking crowd in the CBD area, there is a Ricard Bar within the premises, which exudes a distinctive French feel, and offers friendly bar bites such as deep-fried frog legs with garlic aioli and charcuterie boards. A famous Taiwanese bubble tea chain with 300 outlets worldwide, the Alley marks its entry into Singapore with a premium concept, The Alley Luxe. Apart from their iconic, calorie-busting bubble teas, croissants, cruffins (yes, a cross between croissants and muffins) and kouign-amanns will be sold at their Orchard Cineleisure shop, which is set to open mid this month. The Brown Sugar Deerioca series is their bread and butter; think handmade tapioca pearls in rich syrup mixed with Japanese fresh milk. There are also fruit based beverages from the Aurora Series featuring a selection of ice blended fruit-infused teas in vibrant colours, as well as the Lulu Fresh Fruit series, which consist of a variety of fruit teas topped with sweet cream. Level 2, Orchard Cineleisure, 8 Grange Road. We already have one of the best, if not the best airport in the world, and it’s no wonder there is an intense buzz surrounding the opening of Jewel Changi Airport. Boasting the world’s tallest indoor waterfall, a multi-storey Forest Valley and several walking trails, the architectural marvel is set to become the next retail and lifestyle destination. Of course, what better way to fully represent our sunny isle than with a wide range of local and overseas F&B brands? Here’s what caught our eye. Anticipation is building up for London-based chain Burger & Lobster, which will open its first Singapore outlet next month. Located on the highest floor of Jewel, Canopy Park. It will have unparalleled views of the indoor waterfall and a setting befitting the brand’s three famous items: burgers, lobsters and lobster rolls. Collin’s Grille is a familiar sight to many Singaporeans, with casual restaurants and food court stalls dotted across the island. El Feugo by COLLIN’S marks the chain’s upscale concept – contemporary halal European cuisine. Menu details are sketchy at the moment, but 25-year-old head chef, Koh Han Jie, the first Singaporean to win the Young Talents Escoffier competition, will be crafting the menu. Japan Way 360° is a concept store that melds an in-house restaurant and cafe with a retail shop. Browse through beautifully packaged souvenirs from Japan at The Nomono Retail Corner, or try Suju Restaurant’s four-seasons concept menu along with a pairing selection of sake and wines from the bar. Currently, the store is decked out in real sakura flowers and the decor will change accordingly to the seasons. Shangri-La Group’s first standalone dining concept, Shang Social is a 220-seater that brings together three different cuisines, Cantonese, Huaiyang and Sichuan. What we know: the menus will be created by three different chefs: executive chef Mok Kit Keung of Shangri-La Hotel, Singapore (who earned two Michelin stars for Shangri-La in Kowloon, Hong Kong), executive chef Joe Hou of Jiangnan Wok, Shangri-La Hotel Nanjing, and executive chef Rick Du of Summer Palace, Shangri-La Hotel Shenyang. Peruvian chef Daniel Chavez of Ola Cocino Del Mar fame is the man behind TONITO Latin American Kitchen, which champions Latin American flavours. Chavez promises that the restaurant will exude a laidback feel and offer unfettered views of the surrounding indoor waterfall. The stars of the menu will include the pork tacos, corn tortillas from La Mexicana topped with chorizo, charred onion, tomato mayo and beautifully cooked pork. A unique offering not to be missed is the Tallarin Saltado, a Peruvian-Chinese fusion dish of stir-fried pasta with soy sauce.